NETWORK UPDATE: AGENTS OF SHIELD gained 0.1 in final network ratings… but so did THE FLASH, so they remained in a tie. Also up 0.1 were THE VOICE and THE MINDY PROJECT. ABOUT A BOY and CHICAGO FIRE, however, each lost 0.1. SONS OF ANARCHY (FX) once again dominated Tuesday cable, up 0.03 from last week to 2.28. After that, special events took over, as TBS’s coverage of the AMERICAN LEAGUE BASEBALL PLAYOFFS was at 1.54 (the afternoon game, on Fox Sports 1, was at 0.53), and the BET HIP-HOP AWARDS was at 1.49. The latter was the lead-in for the season premiere of REAL HUSBANDS at 1.18. 19 KIDS AND COUNTING (TLC) was up 0.15 from last week to 1,01, and TOSH.0 (Comedy) lost 0.21 to 0.87. TOSH was followed by BRICKLEBERRY, down 0.12 to 0.57. 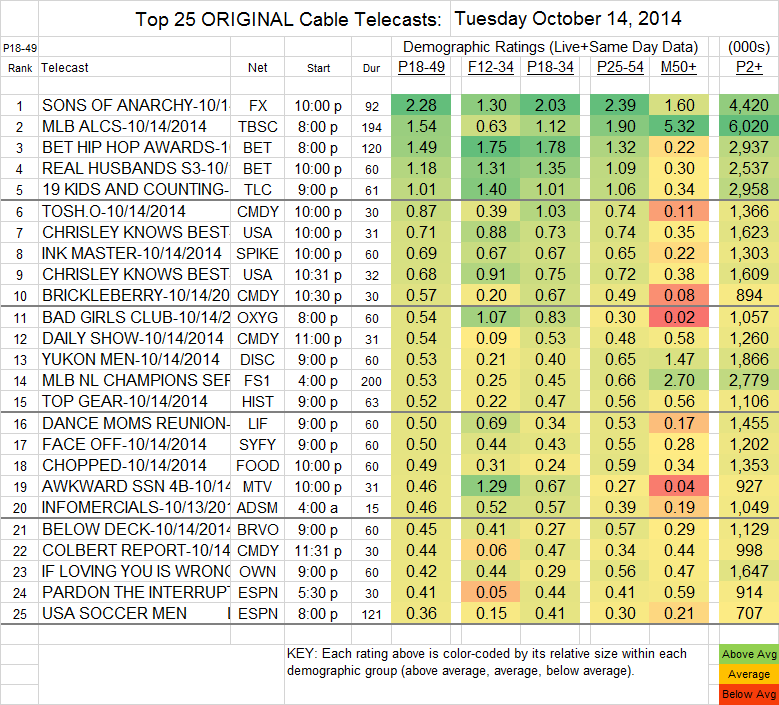 Two season premiere episodes of CHRISLEY KNOWS BEST (USA) were at 0.71/0.68, and INK MASTER (Spike) slipped 0.03 to 0.69. IF LOVING YOU IS WRONG (OWN) lost 0.06 to 0.42. On MTV, AWKWARD was down 0.03 to 0.46, FAKING IT was down 0.02 to 0.31, while HAPPYLAND dropped 0.02 in 18-49s to 0.16, but both of the latter shows took a heavier hit in total viewers (probably younger ones, considering the network), down by around 85K each to 645K/350K.